The mini-kingdom of tonsorial parlors in Hyde Park is undoubtedly Logan Square. 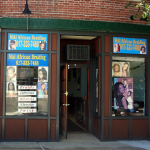 Salons and barber shops specializing for black women, white men, black men, Latinos and Latinas, plus nails and braiding abound in a tiny stretch at the start of Fairmount Avenue. River Street goes south and turns right to head west at the HP municipal building, with Fairmount heading east. It’s that stretch of a few blocks that starts with the Logan Square Barber Shop and sees all those related but different places on both sides of the street. Yesterday, I got a haircut with folklore and barber lore, then I chatted with a barber specializing in African-American hair. No one seems to know quite how the hair center arrived, but everyone with an opinion seems to think there’s plenty of business for all. As a sidelight, I recall a lecture a couple of months ago by Anthony Sammarco in the nearby library. His Hyde Park (Then and Now) is harmless enough, basically a photo collection with a little commentary in a series you likely have seen. One aspect that stuck with me was that even before Hyde Park became part of Boston (1912), it had a shopping shtick. Close by Clearly Square (a few blocks west and within sight of Logan Square) was a clothing and haberdashery conglomerate. Two large department stores and fitting shops were where many, particularly area men came for suits and shirts and such. Now for some inexplicable reason, Logan Square is where hair comes to be snipped and styled. We around here hopped for yet more restaurants. Alas, several promising ones have open and closed in the past few years. Most recently, first TC’s Coffee couldn’t make a go of the pastry biz and the mother eatery Townsends closed with a whiff of scandal. For those, I loved her baked goods, as did so many, but she apparently did not have the traffic of the likes of the close-by Dunkin’. The restaurant with its full bar (including a remarkable collection of ales mated to the meals), was the political and social club meeting place as well as a virtual home to Council President Steve Murphy. I sat with many pols and others by happenstance, at events, for interviews at one or the other. Lackaday. However, a few healthy restaurants remain, notably The Hyde (disclaimer, a son works there). We have several particularistic churches in the same stretch, but mostly it’s hair and nails. 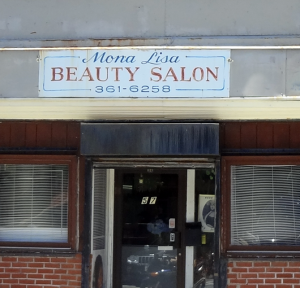 For a bit of humor, the most popular woman’s salon, big, busy and rich went south. Salon Capri was between the two squares and where my wife went. They uber-suburbanized themselves though, planting in Dedham’s Legacy Place, making themselves difficult for former customers to get to as well as more expensive. That might have been a harbinger of doom for the hair biz here, but certainly was not. 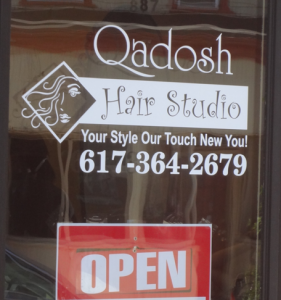 Perhaps symbolic of the vitality of this genre was that Qadosh (oriented toward black women) just took over TC’s Coffee. It had been next to one of those odd little churches. 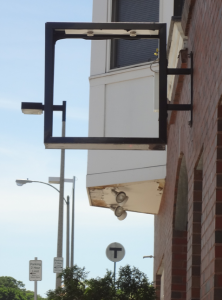 TC’s space is airy, has big windows and benefits from the rehab the restaurant owners had performed on what used to be the preeminent hotel on the Neponset River before it decayed. After a month with not even a hand-written sign of the salon name, Qadosh has painted its door and taken the old TC’s Coffee sign out of its frame, surely in preparation for its own lighted one. Next is Los Magicos Barber Shop (fairly new), seeming to specialize in Latinos. Across the street is Hair by Changes, a full-service place, doing nails on hands and feet, waxing, tanning, facials and such. Heading west, there’s Mona Lisa Beauty Salon, then Luu & Nails. Close at hand is Finesse, which claims to service men, women and children, but notes shaves and fades, suggesting more of an emphasis on black men. Up at the River Street bend, on one side is the Logan Square Barber Shop. 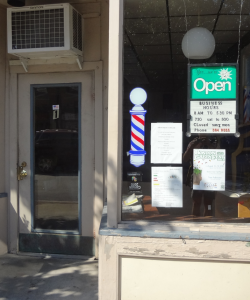 Opposite are a braiding salon and women’s salon that notes both they speak Spanish and can relax hair. On my haircut day, I was in the chair with Al, who is widely called Elvis for his appearance. He spoke of his background as the Wahlberg boys’ barber from his Dorchester days. He is never short of opinions. He could not explain how so many hair joints migrated to Logan Square. However, he was plain that he had been surprised to find his shop the only one left in Hyde Park oriented to white men. Hyde Park covers a lot of streets, but he may be right. I can’t recall another. When we live in Jamaica Plain, we ended up in Roslindale Square for haircuts and begrudgingly, finally tried Logan Square BS. We like the guys, haircuts and prices. In several towns, I’ve had black barbers tell me they’d take a chance on my thin, Nordic type hair, but they didn’t know how to cut it right. Here, I’ve cut the hair of two of my sons. One has my kind of hair and the other has the thick, dark hair from my wife’s side of the family. Those require very different skills and electric razor guides. I stopped by Finesse on the way from my haircut to speak with a barber out front for a smoke. He too couldn’t figure out how so many salons and barber shops concentrated in three blocks. Yet, he said everyone seemed busy and thriving. Now I can’t stop myself from thinking that if the barber shops and salons do so well, they’ll need to invest their profits. Might they finance restaurants? So what’s your point? 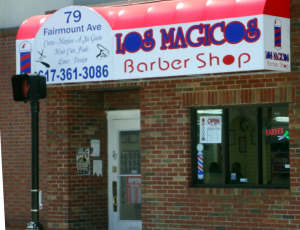 SO WHAT there are a lot of “Latino” & “Black” barber shops & salons in Logan Sq. You didn’t seem to have a problem when they were all White barber shops & salons. Back in the day when that area of Boston was mostly White. Sounds to me that you’re NOT upset at the fact that there are so many barber shops/salons in Logan Sq, it seems like you’re upset that these businesses are MINORITY OWNED!!!! Please look again. It’s the tonsorialists who remark that 1) there are many and culturally diverse salons and barber shops, 2) that as HP has added more variety of residents, they have mirrored that, 3) there’s plenty of coexisting shops, and 4) one barber has been struck that the previous concentration of white oriented shops is passé. No one I spoke with has a problem, rather they are not oblivious. Lower HP instead seems to enjoy it’s diversity. Noticing a trend does not even imply dislike.